I have been a fan of Laura Doherty since I first heard her charming album Shining Like a Star (2011). From the very beginning, her ability to craft relatable lyrics set to developmentally appropriate tempos spoke to her experience as an early childhood educator, starting with her time as the director of Chicago’s Old Town School of Folk Music’s Wiggleworms program. With each album Doherty has honed her craft as a songwriter and performer resulting in High Five!, her best album to date. Coming in at a brief 27 minutes, Doherty packs a lot of fun and musical talent into the 10 songs in this collection. 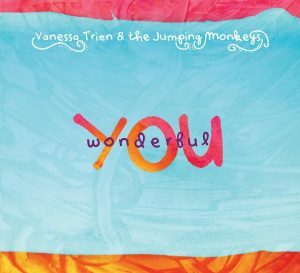 Her signature folk-pop style shines along with the light, airy melodies and catchy lyrics of songs that cover a wide variety of topics including – the first day of school, making friends, lucky charms, different types of pasta and Paulette the Purple Dragonette. Wonderful, complex instrumentations support but never overwhelm Doherty’s lovely soprano. A perfect example being the title song, “High Five.” Featuring a really funky groove, this tune lets the brass section shine while Doherty encourages listeners to get up and move while trying out dances like the Locomotion and The Twist. 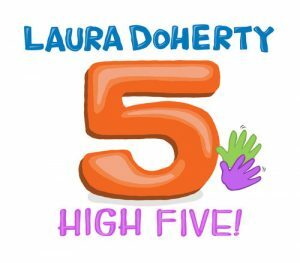 Laura Doherty’s albums are the best kind of children’s music – lyrics are sung from the point of view of a child, songs are short enough to use in programs and storytimes, and the tunes are so catchy and well-produced that parents won’t go crazy listening to them again and again. High Five! is a must-have for libraries and family listening!